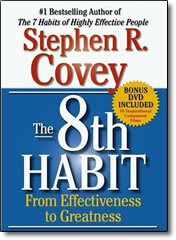 The 8th Habit – Stephen R. Covey – CD or MP3 + Bonus DVD – Discount! The crucial challenge of our world today is this: to find our voice and to inspire others to find theirs. It’s what Covey calls the 8th Habit, the soul’s yearning for greatness and the organization’s imperative for significance and superior results. The world has changed dramatically since the classic, internationally best-selling 7 Habits of Highly Effective People was published, influencing tens of millions. The challenges and complexity we all face in our relationships, families, professional lives and communities are of an entirely new order of magnitude. In order to thrive, innovate, excel and lead in what Covey calls the new Knowledge Worker Age, we must build on and move beyond effectiveness . . . to greatness. Accessing the higher levels of human genius and motivation in today’s new reality requires a change: a new mind-set, a new skill-set, a new tool-set — in short, a whole new habit. BONUS: Order the 8th Habit audio program (on CD or MP3) and receive a FREE bonus video series (on DVD or MP4) with 16 award-winning, inspirational companion videos for your personal use. A $100 value, free with your purchase. You can watch a preview of some of these videos here. Last year in my epilepsy group on Friday morning’s we read through your book, The 7 Habits of Highly Effective People, one of he best books I have ever read. This year we are continuing with the 8th Habit, which includes leadership, legacy and spiritual experiences. I truly like this as I have been studying the Bible for the last 7 + years. Thank you for authoring both of these books.